Whenever I dine at a Thai restaurant, I try to order a different entree but must order the same appetizer. Satay. Chicken, pork, shrimp or tofu satay. It is brought to the table straight from the grill: hot and succulent. Typically, satay is served with a chunky peanut sauce which, honestly, I find doesn't do much for the taste. Sometimes, the sauce can overpower the flavors of the meat itself. (Remember, this is just an individual preference, fostered by the fact that I am not a fan of peanuts.) My version of shrimp satay totally omits the needs for any sauce. 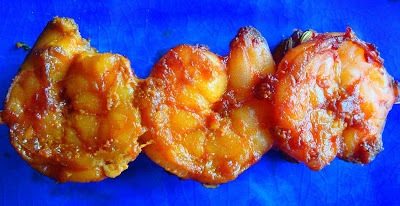 By using strong spices and fresh ginger, and marinating for a couple hours, this shrimp satay can stand on its own. 1. Place fennel seeds, garlic, onion and ginger in food processor and pulse until chunky. Add turmeric, coriander, vinegar and soy sauce and puree to form a thick, smooth paste. 2. Pour paste over shrimp, mix well, cover with plastic wrap and refrigerate for 1 to 2 hours. 3. Remove shrimp from refrigerator. Allotting 3 or 4 shrimp per skewer, pierce skewers through shrimp. Cook under broiler, 3 minutes on each side. Serve while still hot.